Find Englewood, CO Homes for sale. View Photos, Maps and MLS Data Now! A sought after location and neighborhood with award winning Cherry Creek Schools. MLS#7746317. RE/MAX Professionals. (Sewer line comes with transferable warranty) Modern style meets historic charm in this immaculately maintained bungalow that won't last, schedule your showing today! Open House 4/20/19 12pm - 3pm MLS#9429554. RE/MAX Momentum. 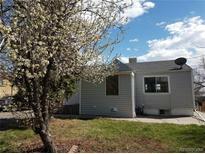 Old Englewood - Quick access to downtown Denver with light rail or Sante Fe Drive. MLS#6574977. ENCORE REALTY. Wonderful Ranch In Englewood * Walking Distance To Downtown Englewood * Close To Transit * Open Living Room With Entry Way * Large Bedrooms * Private Fenced Backyard * Lots Of Off Street Parking * Bright Open Colors Throughout MLS#9509302. Vigil & Associates LLC. Huge lot has tons of possibilities, including potential to build a garage, large single family home, or additional rental units (Buyer to check with the city and/or county regarding zoning and allowed use). MLS#7649336. MB LUNNON RLTY CORP.
Old Englewood - Cash, non-contingent, large EMD, quick closing offers will go to the top of the pile. MLS#4470275. Buy-Out Company Realty, LLC. Award winning Cherry Creek Schools. This home will impress! MLS#4633053. Milehimodern. Arapahoe Acres is a Mid Century Modern Neighborhood is on the National Register of Historic Places. MLS#9747557. Thrive Real Estate Group. You will love this area and this home! MLS#3504536. HomeSmart Realty Group of Colorado. Evanston - Walk to Undici Italian, Cherry Hills Sushi, Thai food or coffee shop, minutes to new Fresh Fare King Soopers. MLS#9898250. COLDWELL BANKER RESIDENTIAL 54. Come and tour this cozy cottage ranch today! MLS#2795881. HomeSmart Realty Group. Old Englewood - RTD Bus and Oxford Light Rail Station are nearby. Great opportunity! MLS#2750350. RE/MAX Masters Millennium. A volleyball area? Badminton perhaps? A new deck? MLS#9017357. KENTWOOD REAL ESTATE DTC, LLC. Greens - This home is just waiting for new owner's imagination and personalization! MLS#3488924. Keller Williams Realty Downtown LLC. Located on University Blvd conveniently located across from St. Mary's Academy. MLS#2134971. KENTWOOD REAL ESTATE DTC, LLC. The home also has a wonderfully finished basement with storage. MLS#8418390. ideal Residential Group. Set Your Showing Now! Welcome Home! MLS#8226865. RE/MAX Masters Millennium. Single story ranch with three bedrooms, two baths, office, and carport. MLS#5419240. Thrive Real Estate Group. Hurry this is a must see home! MLS#4879180. RE/MAX Professionals. South Broadway Heights - Large walk in closet in second bedroom, Recently finished basement with flex area or non conforming third bedroom, Hardwood floors under carpeting on main floor, Large mud/laundry room, Spacious corner lot in vibrant neighborhood, The back yard comes with a large flagstone patio, two storage sheds and plenty of room for a garage, Walking distance to middle and high schools, One block to shopping and restaurants, 10 minutes to Downtown, 5 minutes to light rail. MLS#4807109. Redefy. Harlem - Hurry...This One Won"t Last Long! ! MLS#8224135. Your Castle Real Estate Inc. Please visit www.41CherryHillsFarm.com for more information. MLS#8413133. LIV Sotheby's International Realty. Harvard Gulch - Newer roof. Amazing location near Porter! MLS#2521039. MAKE Real Estate. Just blocks from the light rail station! MLS#3480179. SYNERGY ASSOCIATES INC.